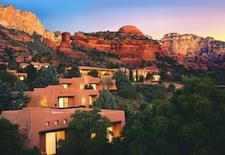 Shermans Travel | Romantic Southwest Weekend: Sedona, Arizona vs.
Sedona: New Age – you will be seeped in all things holistic and wellness-oriented as the city’s location on so-called energy vortexes (said to promote mind/body healing) has attracted a throng of crystal-toting, aura-reading healers and massage therapists, who can rub you the right way (or wrong) depending on your appreciation for or aversion to touchy-feely stuff. It’s all good, so just go with the energy flow. Santa Fe: Old West – there’s enough turquoise, silver, cowboy boots, dried red chili peppers, and bleached cow skulls to fill a Western movie set. You may be surprised how tiny this “city different” is, but that is part of its charm. Everyone seems to know everyone else and the pace is as laid-back as it gets. offering dawn to dusk photo-ops galore, especially around beautiful Boynton Canyon (shown at right). Santa Fe: Endless vistas – the horizon seems to go on forever, creating otherworldly sunsets on this high desert plateau at the edge of the Sangre de Cristo Mountains. Sedona: Depending on your budget, I can recommend two resorts: Spa-lovers should consider a stay at Mii Amo, the spectacular, 24,000-square-foot spa (shown at left) at Enchantment Resort in blissful Boynton Canyon, where peaceful casitas and treatment- and meal-inclusive pricing makes for a totally restorative stay, three nights from $2,250/person, including meals and six spa treatments. If you just want to dabble in spa treatments, stay at Enchantment and book treatments a la carte, from $225/night. 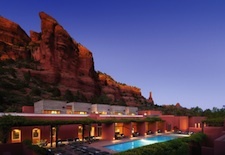 Within Sedona’s city limits, you can also stay and spa at the colorful, 74-room, Spanish-inspired Sedona Rouge, where some rooms offer killer red-rock views and energy-centric spa, from $180/night. 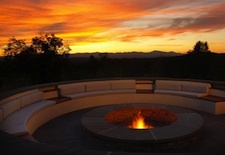 Santa Fe: Downtown or just outside the city limits – the choice is yours. 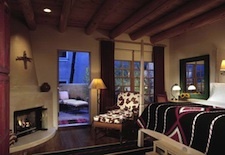 If you want to enjoy easy access to the city’s shops, galleries, museums, and restaurants, stay at the atmospheric Rosewood Inn of the Anasazi, a 58-room boutique hotel right on Santa Fe’s historic square, featuring Southwestern details such as hand-carved doors and Pueblo-patterned accessories (shown at right), from $232/night. For a resort experience, unpack your bags at Encantado, An Auberge Resort, a 65-suite property set on 57 acres and offering contemporary Southwestern-style casitas with fireplaces and soaking tubs, a sophisticated spa, and heated pools with panoramic views, from $350/night. Sedona: One of the city’s best-known eateries is Elote Café, where chef Jeff Smedstad is lauded for his lamb adobe and other nuevo Mexican creations such as short rib empanadas, from $75 for two. For gourmet comfort food, head to Reds in Sedona Rouge, where chef Ron Moler serves tasty fare such as a beef or fish sliders trio, from $60 for two. Santa Fe: While on Canyon Road, stop into The Compound for lunch or dinner to taste chef Mark Kiffen’s delectable New American cuisine, such as the jumbo crab and lobster salad (at lunch) and Muscovy duck breast (at dinner), from $50 and $110 for two, respectively. Flavor-packed Mexican is on the menu at The Shed, a quirky and bustling eatery right off the main square that celebrates the heat of the New Mexico chile, from $60 for two. Brunch options include the refined Anasazi Restaurant at Rosewood Inn of the Anasazi, where options include the Spanish benedict or huevos rancheros with smokey black beans from $50 for two, and the eclectic and colorful Café Pasquals for a yummy breakfast quesadilla, from $30 for two. Terra restaurant at Encantado is worth a visit even if you’re not staying there, for its inventive contemporary Southwest cuisine and seriously indulgent side dishes (truffle fries, poblano mac ‘n mushrooms) and courtyard fire pit (shown above at left), from $110 for two. Sedona: One word: Tlaquepaque (pronounced tuh-la-keh-pah-keh), an Arts & Crafts Village in central Sedona (shown at right), where shops selling jewelry, clothing, and handicrafts, as well as several lovely art galleries, line atmospheric, old Mexico-style courtyards. Santa Fe: The city’s entire downtown is one endless shopping mall – albeit a pricey one – filled with jewelry and leather boot boutiques and art and sculpture galleries. Check out the Native American silver market underneath the eaves of the 17th-century Palace of the Governors. Visit Canyon Road for more than 100 stellar art galleries, where it’s free to browse and on Friday nights some galleries serve wine as visitors stroll on informal art walks. Sedona: A hike though scenic Boynton Canyon to one of the energy vortexes, where even if you don’t ascribe to New Age beliefs, the surroundings alone will make you feel pretty darn enlightened. Taking in views of the city’s most famous red rock formations, such as Bell Rock and Coffee Pot Rock. 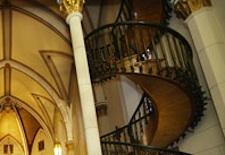 Santa Fe: The Loretto Chapel is a small church with a big mystery: the elegant and intriguing spiral staircase to the choir loft constructed in 1878 by an unknown carpenter using no visible means of support and no nails (shown at left). Visit the Georgia O’Keeffe Museum to admire rotating collections of one of the Southwest’s most famous artists. If you have time, plan a scenic day trip to Taos (80 minutes by car) to enjoy additional shops and galleries, the spine-tingling Rio Grande Gorge Bridge and lunch at Orlando’s New Mexican Cafe, from $25 for two. Okay, so now the decision is yours: the wellness-focused and artsy ambience of Sedona or the western-centric and desert-plateau vistas of Santa Fe. I hope you eventually get to experience both. See our Santa Fe destination guide and our Sedona destination guide for more trip-planning information, then use our Travel Search price comparison tool to find the lowest rate on flights, hotels, packages and more travel deals.